Digging up the funds to pay for a college tuition can be hard work, that’s for sure. If you’re like many students, you may think you don’t qualify for financial aid, or don’t know where to look for it. The good news for Nebraska residents is that there are probably more resources than you’re aware of to help fund your college education. Nebraska provides scholarships and grants for state residents of various levels of financial need, academic success, and hours of college enrollment. Some private organizations may have financial aid offers for you as well. Let’s walk through the four steps every Nebraska resident should take to pay for college. Your hunt for financial aid begins when you submit the FAFSA, which stands for Free Application for Federal Student Aid. This form is the first, and arguably most important, step in your financial aid search. Tip: fill it out early so you can meet other application deadlines down the road. It is a lengthy form, however, so be sure to ask for help if you have any confusion, or consult our handy guide to walk you through the process. In the end, submitting the form allows you to be evaluated for potential financial aid opportunities, and could connect you with the financial aid dollars you need to fund your college education. Once the FAFSA is submitted, you can apply for aid through state-specific applications, as well. Nebraska offers a couple grants and scholarships exclusively for state residents. Access College Early (ACE) Scholarship Program provides funds for qualified low-income Nebraska high school graduates to enroll in a dual enrollment or early enrollment program at participating Nebraska colleges and universities. A dual enrollment program requires students to take college courses while in high school, and an early enrollment program requires students to start their first college semester in the summer rather than the fall. Nebraska Opportunity Grant (NOG) for Nebraska residents pursuing a post-secondary education in Nebraska. Awards are administered by the specific institutions, so students must apply to a college first in order to be considered for the grant. Community College Gap Assistance Program for Nebraska residents enrolled in non-credit courses at Nebraska community colleges. Financial aid eligibility is typically contingent upon a student’s enrollment in credit-earning courses, so this program’s qualifications go against the norm. Through it, Nebraska’s government works to increase the number of Nebraska’s aid recipients and assists students in earning jobs in high-need fields. Visit the website for Nebraska’s Coordinating Commission for Post-Secondary Education to read more about your state’s financial aid offerings. You may qualify for scholarship and grant opportunities offered by local or private institutions as well. For current high school students, a good way to locate these opportunities is to schedule a meeting with your high school guidance counselor. Your counselor can inform you of local financial aid packages that exist and assist you in applying for them. Set reminders on your phone to keep track of guidance appointments and application deadlines. Additionally, it can help to conduct some internet searches of your own. A trick is to use key words indicating your intended major, hometown, or high school. Nebraska’s Lincoln Community Foundation provides multiple scholarship opportunities for the state’s students that you can apply for here. Depending on your personal situation, you may be in need of more financial aid. A private loan is another source of aid dollars that may be able to bridge the gap between your ability to pay for a college education. 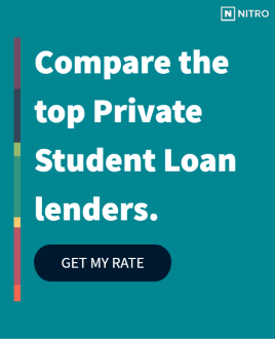 Before settling for any Nebraska private loan, check out our NitroScore tool to get a better idea of the size of loan you need, and which of our highly vetted loan partners can offer you the best rate. To use the tool, all you need to do is enter a college and major into the boxes provided. The tool will calculate your total costs, your salary after graduation, and potential loans needed from the information you provide. It will then generate a score that tells you how easy those loans will be to repay based on your projected salary. You can personalize the results further by entering info about scholarships, grants and savings, and comparing different college/major combinations. A college education doesn’t have to be out of your price range. Start learning about the financial aid resources available for Nebraska residents today.